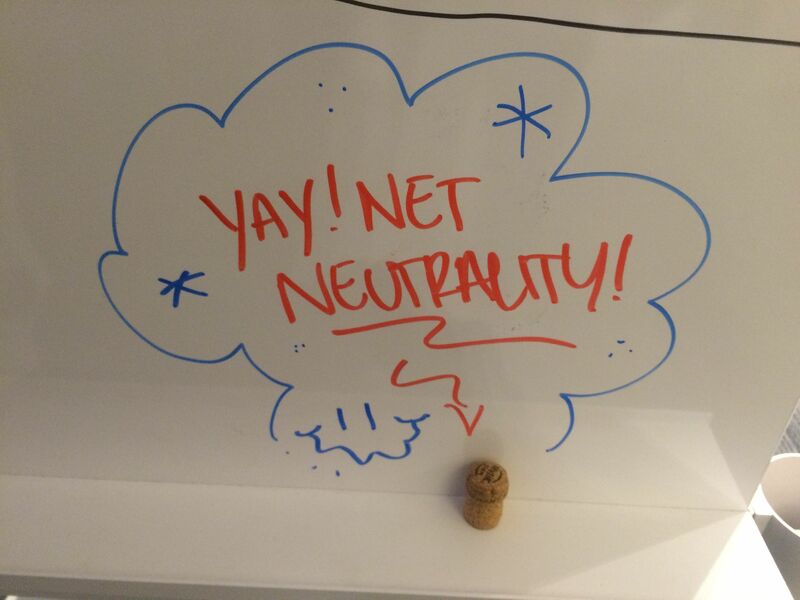 Net Neutrality – Pop Bottles from David Moore on Vimeo. Update, Thurs. Feb. 26th: Fight For the Future co-founders Tiffiniy Cheng & Holmes Wilson are also the original co-founders of this non-profit, PPF! Their focus is digital rights & internet freedom, ours is civic engagement and open government, wonderfully overlapping. Follow us on Twttr list if you’re so inclined. “Today, the FCC will vote on the strongest net neutrality rules in history. Rules that one year ago no one thought were even a remote possibility. Activism works. But it only works when you refuse to compromise, and get to the finish line with your goals intact. Many times along the way the past year there were DC insiders or groups encouraging us to back off, tone down our tactics, or consider compromises. We refused. Now we get to celebrate the sweetest victory against one of the world’s most powerful lobbying armies. I’ll add: what other important public-benefit causes could benefit from a bracing dose of Fight For the Future team-style creative online organizing & honestly-yet-factually-outspoken activism? I have some ideas of issue areas that I’d be happy to share over sparkling wine, if you’re interested in the tech-politics scene. Today: awesome front-page Boston Globe profile of Tiffiniy Cheng and friends at our rad sibling non-profit, Fight For The Future – I’ve been working with this crew for over a decade now. I see you, Holmes & Evan & team. See also John Lilly’s appreciation. In a macro U.S. political sense, I concur with the analysis that “situation nowhere near good” – but worth keeping in mind that even with key political indicators trending the wrong direction, there have been two major victories for democracy and open technology in the past four years. Over the past year, the fight for real net neutrality in Title II rulings (i.e., nothing less than common carrier) ended in a hugely-pleasantly-surprising triumph for free expression online over the deeply-established telco monopolies. You already know, Fight For the Future was in the middle of the scrum in both – and must note that lots of other allied organizations & policy experts have been in the trenches for over a decade. One quote from the article, to highlight & drive home: “A report released last week by Harvard University’s Berkman Center for Internet & Society concluded the ‘networked public space played a central, arguably decisive, role in turning around the Federal Communications Commission policy on net neutrality. '” Check my May 2012 OC blog post on Prof. Benkler et al research on networked public sphere & SOPA/PIPA, so vital. So a sliver of semi-good news for now is that open tech advocates have barely begun to see a fraction of a decimal point of investment in tools for this nascent networked public sphere, compared to general civic tech funding (i.e., companies with series C rounds in the tens of millions of dollars that sell services to government clients) – so while reforming D.C. lobbying culture remains a huge problem, it’s hopeful that public-benefit online organizing tools will continue to develop and gain popularity and impact. Last, drive home net neutrality with your U.S. rep by ‘whipping’ or thanking them at https://www.battleforthenet.com, scroll down for the Congressional scoreboard. It’s not official yet until the big FCC vote on Feb. 26th, and then big-gun telco litigation is expected to last for years, so broad public support of Title II net neutrality will still have significant effects after this month. Go TYC & team.